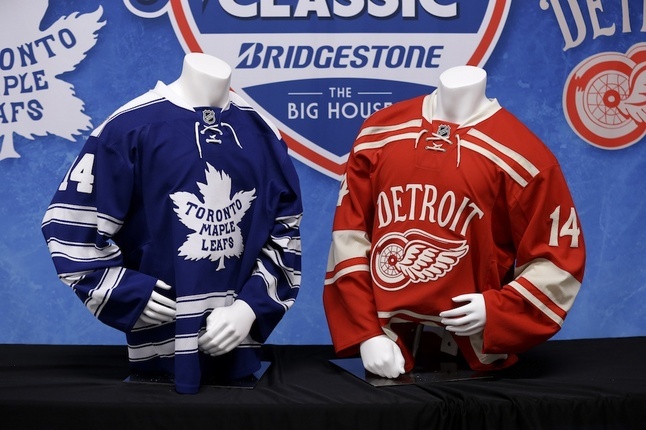 Posted on Sun, Apr 7, 2013 : 1:31 p.m.
Jerseys to be worn at the NHL Winter Classic hockey game are shown on display in Detroit, Sunday April 7, 2013. 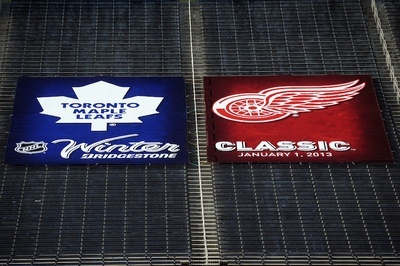 The Winter Classic between the Toronto Maple Leafs and the Detroit Red Wings at Michigan Stadium, canceled this season due to the NHL lockout, has been rescheduled for Jan. 1, 2014, next season. DETROIT -- All fall, the University of Michigan and Ann Arbor waited on the NHL and its lockout, to find out if the scheduled 2013 Winter Classic at Michigan Stadium would go on as scheduled. When the highly anticipated event was eventually cancelled, plenty in Ann Arbor weren't too happy. But now, as the NHL restarts the planning process on what could be the biggest hockey event ever staged, commissioner Gary Bettman said cooperation with the Michigan athletic department has been critical. At a Sunday morning press conference at Joe Louis Arena, the NHL officially announced what had been an open secret: that the two sides have rescheduled the event for Jan. 1, 2014 between the Detroit Red Wings and Toronto Maple Leafs. The announcement comes two weeks after Michigan's board of regents reaffirmed the facility rental contract between the two sides. The game will start at 1 p.m. on New Year's Day, Bettman said. The league also announced that the Great Lakes Invitational will be held outdoors at Comerica Park in late December, as part of the Hockeytown Winter Festival at Comerica Park. Michigan has played in every GLI since 1974. An outdoor GLI was part of the plans for the 2013 Winter Classic. The NHL plans to break the Michigan Stadium attendance record of 114,804 at next year's Winter Classic. Wolverines coach Red Berenson represented the University of Michigan at the announcement, with most of the athletic department in Atlanta for the Final Four. He compared the event to when Michigan and Michigan State played in The Big Chill, but said with two of hockey's fan bases converging, the crowd could be even bigger. The official attendance of The Big Chill, verified as a Guinness World Record, was 104,173. The NHL's plan all along has been to break that record and the Michigan Stadium attendance record of 114,804. Despite the cancellation and the year off from what’s become a successful annual event for the league, NHL officials said they expect no dropoff in excitement for the 2014 Winter Classic. Bettman said the original scheduling of the event at Michigan Stadium wasn't done with the possibility of a lockout in mind as the unique venue does provide a kind of insurance policy for fan excitement. Tom Wilson, the president and CEO of Olympic Entertainment, said the city of Pittsburgh saw an economic impact of around $30 million from having 80,000 people at the Winter Classic game. The league expects an additional 30,000 fans at The Big House -- but the total economic impact will also be divided between Ann Arbor and Detroit, which will host the multiple alumni games as well as the GLI and junior games. Ann Arbor officials have estimated the economic impact at $15 million. And on Sunday, the NHL was looking at the positive of the year delay: with more planning, the game can be done even better. “The fact is, the more time we have, the more things we can do better,” Bettman said. Kyle Austin covers sports for AnnArbor.com. Mon, Apr 8, 2013 : 12:23 a.m. Isn't there a football game that day and their league will be unlikely to strike? Sun, Apr 7, 2013 : 11:10 p.m.